Here is a small map to show you our location or find us on google maps. If you are in Siem Reap and you are still unsure where to go, please call us on either of the numbers above. Thank you very much for getting in touch. 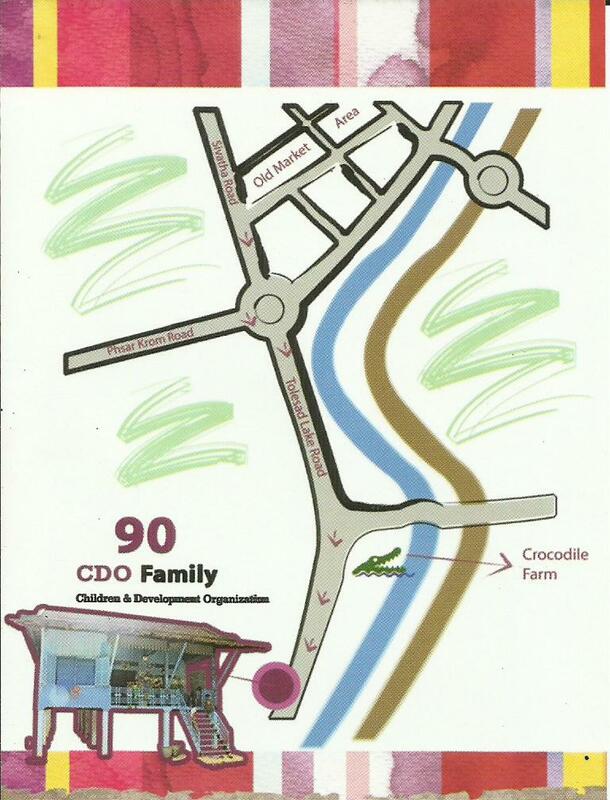 We can always do with a helping at CDO, so we would love to have you come and visit us! please can you email Morn Savorn at this address to arrange when you come- info_cdo@yahoo.com – we are having a bit of difficulty with our website email at the moment so this would be best. Otherwise it is no problem for you to just turn up and we can sort something out then (see ‘Contact Us’ on the website for directions). Hello, I am with myself and two other Canadian females. We are hoping to come to CDO orphanage today. It may be short notice but we would really like to come and spend some time with the children. We are willing to do anything needed. I’m a young female Australian passionate about education, craft and music. I love working with children and have been a singing a guitar teacher for 4 years. I’m currently staying in Siem Reap after traveling to Baray District, Kampong Thom to do volunteer teaching only to find that school is on holiday for two months. I am a bit disheartened by this, but would like to come to your orphanage and help put smiles on children’s faces. I have my guitar with me, as well as a small amount of paper, pens, pencils, textas and soft toys. I would have more but I left most for the school in for when they reopen. If nothing else I would love to come and see your orphanage and give these things to you. If you allow me, I’ll do what I can to teach English and mathematics. I tried to send to your email but it didn’t work. My name is Brendan and I’m an Australian currently traveling in Cambodia. I would like to volunteer with your organisation when I arrive in Siem Reap, which should be in the next week. I am a qualified teacher and a fit and healthy person, so I would be happy to help in any way I can. If you could get back to me regarding how I can help (and any handy tips about where to stay close to you guys in Siem Reap) that would be great. Really looking forward to meeting you all and helping out. I am in Siem Reap for another two days and would love to have the opportunity of helping out at an orphanage for the day or half day? Looking on the map we are about 10 minute tuk tuk ride away, near Siem Reap town centre. Is that correct? We are able to come along tomorrow if that suits? There are 3 females and 1 male. Hello, I am an American female and am interested in volunteering for at least a week and a half. I am currently in Kampong Cham, and will be in Siem Reap in a few days. I can come as soon as Monday if it is a possibility. I would love to do anything I can to help. I have a little teaching experience and could teach englush, math, or whatever is the most useful. I tried to send an email but am not sure that it worked. Thanks for your your help. Please kindly find attached the application form for year 2013-2014 and an example for easier reference. – All cases must come from EXTREMELY POOR FAMILIES with previous proven screening. – We are accepting maximum of 50 cases per country for this year. – The form must be sent to us at least 2 months prior to the school year. – We may not sponsor the full year tuition fee, so the family may have to bear part of it. – All approved fund must be paid directly to the school and the organization is responsible to send us the official receipts from the school with all relevant information within 30 days after school started. – Performance records from previous year for each student must be attached with each application form. – Each sponsored child must be requested to write a brief letter in english every quarter to our specific sponsors upon request. – Each sponsored child must complete a min. 10 hours of volunteering services for the poor in year 2013-2014. – Final approval decision and amount are subjected by Sunshine Action committee members. Room 703A, 7/floor, Block B, Hoi Luen Ind. Centre, 55 Hoi Yuen Road, Kwun Tong, Kowloon – HONG KONG. Your attention is much appreciated & if you have any questions, please feel free to contact us at anytime. Funding is limited, so hurry up and apply asap! Hello, I will be visiting Siem Reap with my daughter by the end of February this year. We would be grateful if you could let us know if it would be possible to vist CDO for a day or half day. We would be happy to help out. Some friends told me about your orphanage. I would like to volunteer there if possible. I am flying out on Thursday and I would like to volunteer tomorrow, Wednesday, 29 January. I am sorry for the late reply. If you ever come back to Siem Reap please visit us, we would appreciate your help! My name is Emma, I am 29 years old. French and I live in Hong Kong. I would like to help you and volunteer for 10 days in May (from April 26th to May 6th). Can I help you with anything ? I love kids and would be very happy to help with any task. I’ve tried to send you an email but it didn’t work.